[London, 21 September 2017] Suppliers of managed services are taking on more responsibilities as they become the driving force for IT industry growth, delegates at the Managed Services & Hosting Summit were told in London this week. More than two hundred managed services providers (MSPs) and aspiring providers of managed services were advised their need to become rounded providers of business productivity, by adopting the right mindset, getting more training on key issues and by working together to offer a more comprehensive range of services. Mark Paine, Gartner Research Director told the conference that service providers had to take account of the changing attitudes of buyers by focusing on the business outcomes and the raised expectations among buyers now that IT has had to become a productivity asset for the business. And they need not try to do it all themselves – partners can co-operate to address the wider market requirements, he said. MSPs had to carefully choose go-to-market partners that can talk both technology and business; and they had to start with a vision; look at use cases; and consider processes, challenges and outcomes for their customers. Customer acquisition costs (CAC) versus lifetime value (LTV) also had to be brought into the equation, considering margins, partnering agreements and questions as to who owns the invoice, plus the on-going up-selling/cross-selling opportunities. The rewards were there through continuing revenues and repeatable business, as successful MSPs have shown. The rewards for getting it right are substantial, Mark Paine says, including valuable access to customers’ ecosystems, becoming a pivotal part of customers’ success stories, and benefiting from lead sharing with technology partners. The added benefit of recurring revenue from cloud services is substantial and this was echoed at the Summit by Michael Frisby, Managing Director of Cobweb Solutions, which sells cloud solutions from Microsoft, Mimecast, Acronis and others. Frisby said: “We became a cloud managed service provider from originally focusing on traditional solutions like Exchange, and 95% of our revenues are now recurring. But you have to make sure you get the marketing right to do it.” Continuing training and education of the MSP were essential, he added, pointing out that Cobweb itself had boosted its investment in this four-fold in the last year. Other issues covered included the growing importance of compliance particularly with regard to GDPR: legal firm Fieldfisher’s partner Renzo Marchini warned that the rules were changing and the impact on MSPs would be profound. Service providers are to be regarded as ‘data controllers’ under GDPR, with that comes the potential for huge fines in the event of regulation breaches. The theme of partnering was confirmed later in a round-table discussion when the Global Technology Distribution Council’s European head, Peter van den Berg, outlined how distributors were investing heavily in services and education. Security was also a key issue, with the service provider very much in the firing line in the event of any incident. Datto revealed some of the latest research from its global survey: Business Development Director Chris Tate revealed that “87% of our partners have had to deal with a ransomware attack on behalf of their clients.” Earlier, SolarWinds MSP had shown how all-pervading the issue was becoming in discussions with customers, and how MSPs needed to increase their understanding, particularly in relation to the challenges faced by smaller businesses. The Managed Services & Hosting Summit, now in its seventh year, was also a platform for other news: Kaspersky’s Global Product Manager Oleg Gorobets made the case for its growing programme for better security among MSPs. But there was a general air of optimism with the prospect of vast fields of data and an increasingly information-rich environment produces new sales and growth opportunities for the MSP according to David Groves, Director of Product Management, Maintel speaking on behalf of sponsor Highlight. M&A specialist Hampleton’s Director, David Riemenschneider, demonstrated that these opportunities and the surge in demand in such areas as AI and security could yield rich rewards for MSPs building value into their own business while addressing the need to create value for their clients. He pointed to heightened interest in services providers, especially those with security, financial services or automotive expertise. 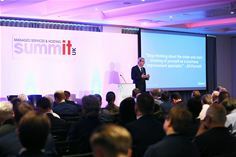 Managed Services & Hosting Summit 2017 (www.mshsummit.com) sponsors included: Datto, Highlight, Kaspersky, Mimecast, SolarWinds MSP, Autotask, Cisco Umbrella, ConnectWise, DataCore Software, ESET, ForcePoint, ITGlue, Kingston Technology, Nakivo, WatchGuard, 5NineSoftware, Altaro, APC by Schneider Electric, Beta Distribution, Continuum, Deltek, Egenera, F-Secure, Identity Maestro, iland, Barracuda MSP, Kaseya, RapidFire Tools, SpamExperts, Webroot and Wasabi.